I’ve always had an interest in WWII. My grandfather flew B-25 bombers over Italy in 1945, making the Nazi retreat as tedious and troublesome as possible. My great uncle, grandfather’s brother, was a soldier in Patton’s army, fighting his way through Sicily, Italy (Anzio), and onward to the infamous Eagle’s Nest. I dedicate this review to their memory. Besides reading books on WWII, watching WWII movies, and coaxing all the information I could from my relatives, I’ve been playing WWII-themed games, miniatures, PC games and console games since the early 80’s. 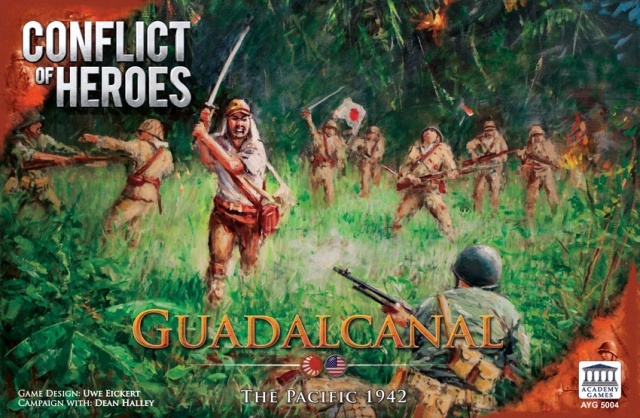 While I’ve since expanded my interest to many other historical periods and non-historical fare, I always return to WWII, as I have done recently with this latest offering from Academy Games, Conflict of Heroes: Guadalcanal. Let’s make one thing clear; I am an Academy Games fan boy. Wait. Don’t run away screaming “bias” just yet. If you think about it, becoming a fan doesn’t happen overnight. My love of the Conflict of Heroes (COH) games is based on its intuitive combat system, superbly-written rule books, the impressive modeling of unit reactions and statuses, and the ongoing support and improvement for the entire COH line, including a solo expansion, a card-based firefight generator and a Wrecks & Destruction pack for amping up the realism of your tank battles. Given that Guadalcanal is the latest installment, I’ll focus mainly on the aspects that set this edition apart from the others. 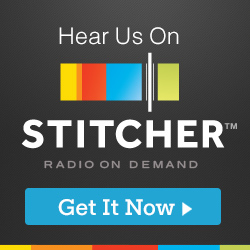 If you are new to the system, don’t fret. In fact, rejoice! COH is a system you must play, and I’m a bit jealous you get to experience it for the first time. I believe any COH game would be a fine place to begin. If you are new to the system or just wondering about what’s new in Guadalcanal, please read on. I hope that you find it to be as exciting an addition as I did. Anyone who knows anything about the battles that raged in the Pacific during WWII knows that combat and battlefield conditions were vastly different from those across the Atlantic. 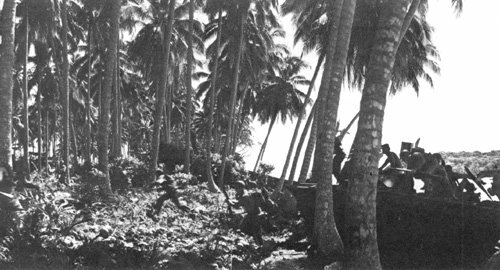 U.S. Marines clashed with the relentless Japanese army in environments best suited for animals and insects than actual human beings. Gone are the vast open expanses of Russia and Poland found in COH Awakening the Bear and COH Price of Honor. They’ve been replaced by heavy and light jungle, groves of palm trees, stretches of dense Kunai grass, coastal beaches and rivers, and smatterings of huts and villages tucked among snaking hills and valleys. One of the most interesting new terrain types is the Palm Grove. A unit in a Palm Grove hex receives a +1 defensive modifier, but if line of sight (LOS) can be traced through an additional Palm Grove (in other words, you’re sitting in the second of two Palm Grove hexes) you receive an additional +1, bringing your defensive modifier to +2. Beyond that, LOS is blocked. 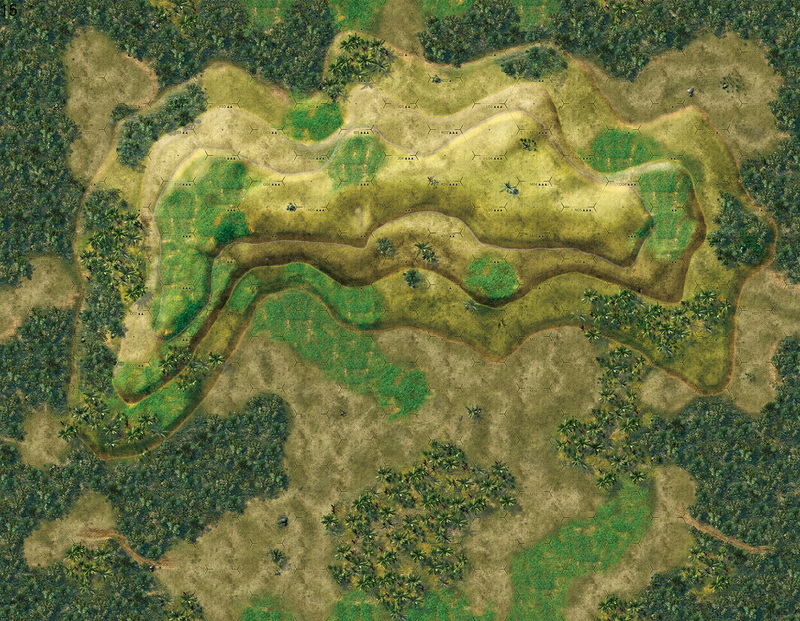 A new addition to the terrain in COH Guadalcanal are the elevation indicators. These are small triangles inside elevation hexes and range from one to three. These are a welcome add, and essentially eliminate any ambiguities while determining LOS from hill hexes. Another new terrain type is Dense Jungle. 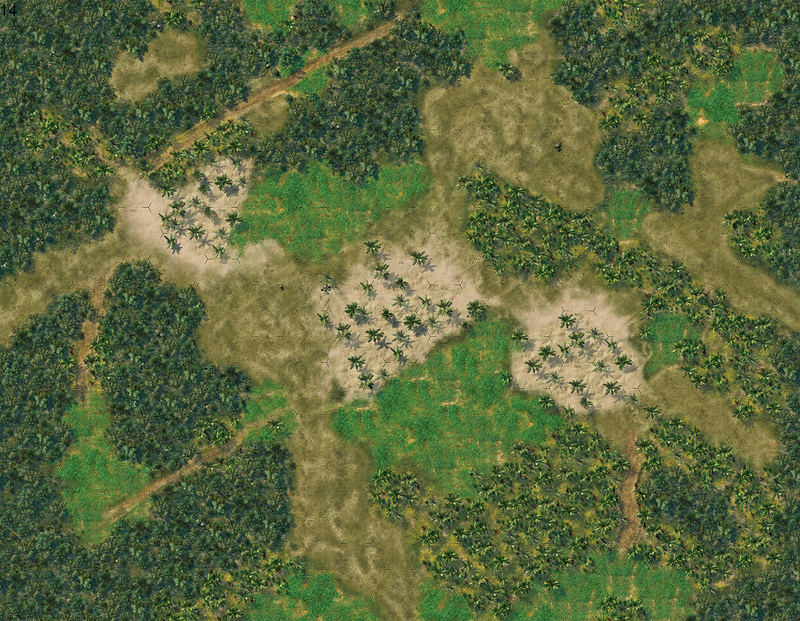 The game models the difficulty of slogging through this terrain by requiring units to pay an additional two Action Points to enter. 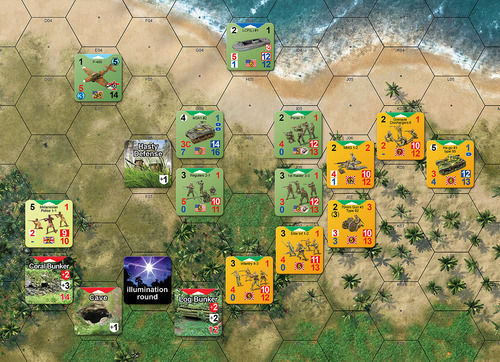 The consolation is that units in Dense Jungle receive a +3 modifier to their defense. Trench foot and dengue fever aside, you’ll be tempted to stay a while when taking up a commanding position inside a jungle hex. 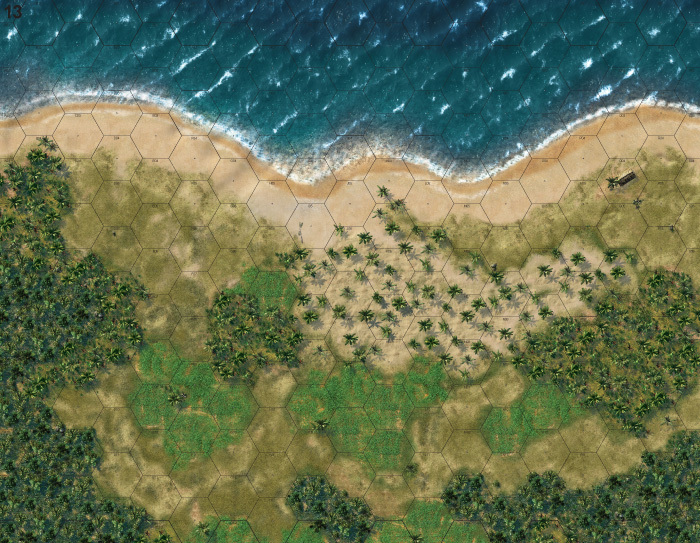 Finally, a number of terrain “overlays” of varying sizes and types are included in Guadalcanal to allow for an endless variety of new boards. With all that great new terrain ready to challenge your strategic thinking, there’s unfortunately a downside. While the artwork is absolutely phenomenal (nearly photo-realistic), my friends and I had a difficult time discerning the borders of some hexes, especially in the Dense Jungle areas along board edges. I’m talking about holding the map up to a bright light and still having a hard time picking out the hexsides. Another friend had a hard time separating Light Jungle from Dense Jungle. The artwork is different for these two types, but it’s subtle enough to cause a double-take now and then. Of course it’s possible that my boards are printed darker than others, but it’s an issue worth pointing out. I always say it doesn’t hurt to hit people over the head when designing hexes. Going for realism is great, but never sacrifice an inch of playability to make the board look nice. I would rather have gaudy, thick-bordered hexes than hexes I can’t see. 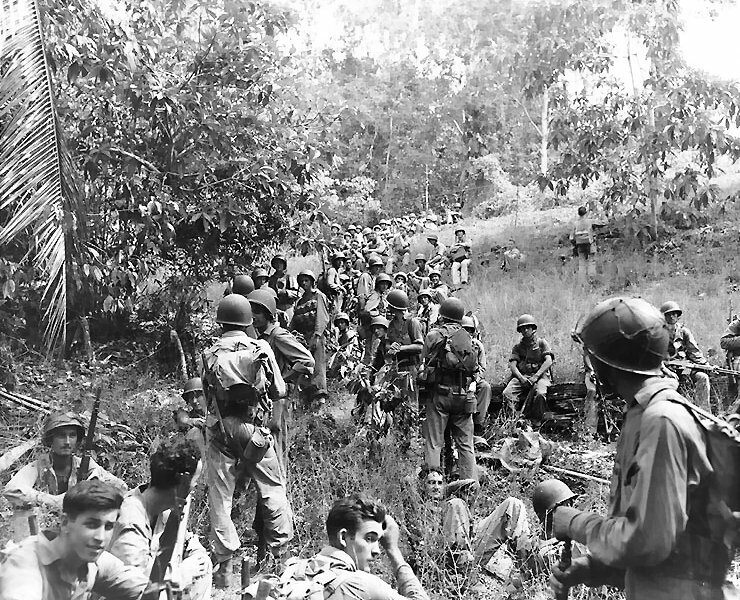 Nevertheless, the patchwork of varying environments in COH Guadalcanal provides a challenging and refreshing backdrop to the included 12 historical firefights (scenarios). 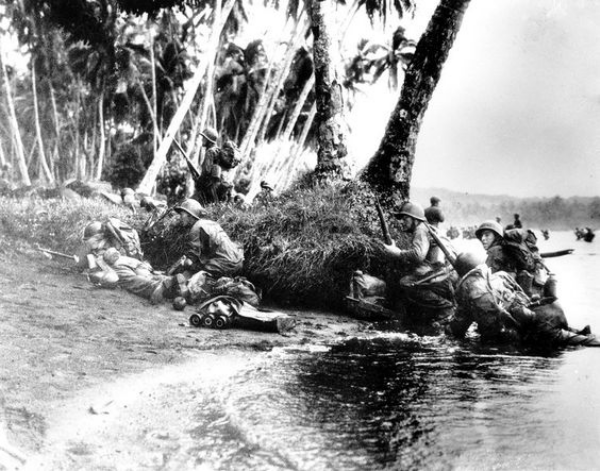 It would be easy to create new maps, counters and scenarios and call it a day, but in order to succeed in bringing the battle for Guadalcanal to life, the unique way in which the Japanese soldier fought and died must be part of the design. The lead designers, Gunter and Uwe Eickert, and Dean Halley, brought these facets to reality with the addition of the Bushido system. 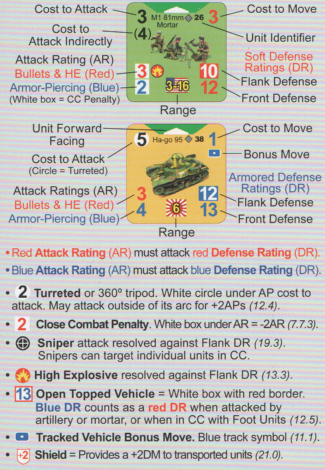 In previous COH games, each side loses Command Action Points (CAPS) as units are lost, adjusting the CAP track accordingly. This is still true for the Marines in Guadalcanal, but the Japanese are not subject to this rule. Instead, modeling the complex set of Japanese values stressing honor and loyalty, the Japanese generate and lose Bushido Points (BPs) in ways specific to each scenario. These BPs translate directly into the gain and loss of CAPs for the Japanese player. Often these BPs are generated by eliminating U.S. Units, but additional, creative BP gains and losses are found in the scenarios. For example, in the firefight called “Break Out,” Japanese gain a BP each time they successfully rally. 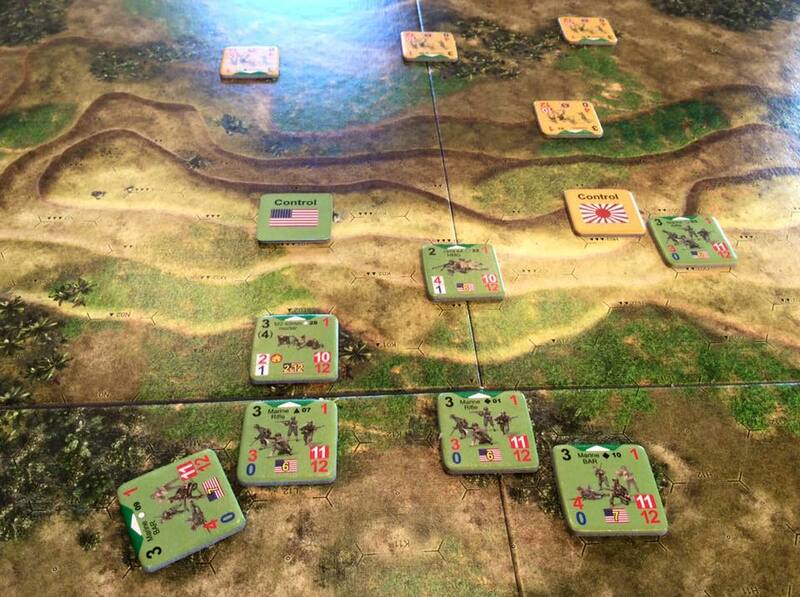 In “Edson’s Lucky Raid,” a BP is gained for each unit that remains hidden at the end of a round, and in “Goettge’s Retribution,” close combat and assaults by U.S. troops are valued and get the Japanese foaming at the mouth, awarding a BP for each Japanese unit eliminated in this way. In practice, Bushido adds a layer of depth and strategy beyond the standard scenario objectives. It’s not enough to just “survive” and reach an objective. To be successful as the Japanese, it’s important to be fully aware of how to generate your BPs, which have been cleverly crafted as a thematic reflection of the motivating factors and combat doctrine in each scenario. The Japanese units were further fleshed out with the addition of “No Hit” counters added to the pool of hit markers. These are a terrifying new addition for the Marine player. Each scenario specifies how many “No Hit” counters to add — up to five — and playing with these incentivizes the Japanese player to act in a more historical manner. The Japanese player, knowing that the likelihood of drawing a “No Hit” counter is a reasonable outcome, may feel more inclined to run head first toward the Marines. This fact can’t be overstated. What continues to enamor me about the COH system is how the designers manage to coax historical actions and reactions through the design of the system itself. A guy from Wisconsin, in the role of a Japanese infantry unit, feels — really feels — that charging at the enemy may be a good idea. Now that’s a stellar accomplishment in game design. This design flows through to the hit counters themselves. For example, a Marine unit pulling a Suppressed result increases the cost to fire by one, and decreases combat effectiveness by two. Now you can still fire if you want, but the counter compels you to act in a manner consistent with the type of hit you received. Similarly, a Japanese unit pulling a “Berserk” result will be required to attack via Close Assault, if at all. The unit’s cost to attack is reduced by one, and its defensive ratings are increased. Of course you could keep the unit back and rally, which is how you remove a hit, but once again, the system itself nudges you in the direction of embracing your inner Japanese warrior. There’s just no way I’m going to pass up the opportunity to charge at my enemy with a “Berserk” counter, and the “No Hit” counters only sweeten the deal. Banzai!! 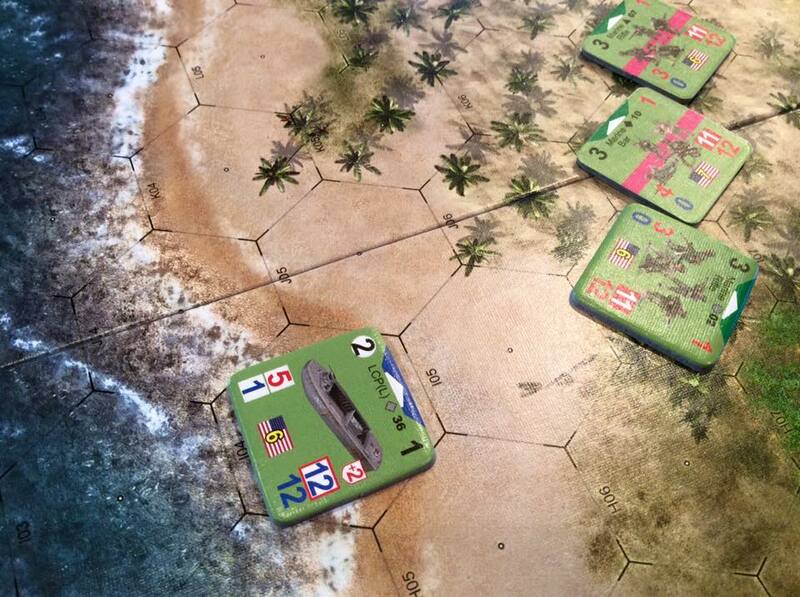 The COH line continues to build on its solid, easy-to-learn system with a batch of challenging new scenarios and rules in Guadalcanal. While I do enjoy the epic tank battles on the Eastern Front, the tense, close, unforgiving terrain and infantry heavy combat of Guadalcanal will hold my interest for a long time to come. The great thing about this game is that it really feels different from the others, as it should be. I consider that to be a considerable accomplishment. With the greatest generation slipping away from us, playing war games is surely a way to honor the sacrifices of our loved ones and enjoy all the freedoms we’ve inherited. That includes the freedom to come together with our friends to laugh, drink, learn, and play together around the game table. Awesome! Have fun. It’s such a great game.